Add a new look to your sponge painting projects with this great accessory. Ocean sponges create unique paint textures and designs on just about any surface. All-natural product -- shapes and sizes will vary. Pack of 8 assorted sponges. My 2nd graders are studying plants. We wet the sponges and put in pan with water then poured wild birdseed. Each day we observed and recorded changes to our sponge gardens. When the lessons began the kids were surprised to learn than sponges were ocean animals. 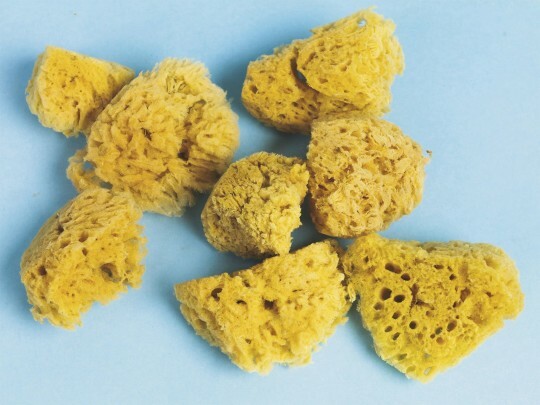 Used opportunity to teach history we used theses before we made our own animal biology how sponges live in the ocean and ecology why the real sponges are better to sprout seeds than the artificail chemically treated ones. The kids were entranced. The kids liked painting with the sponges. It went well with the sea theme. However the kids didn't get to finish there 8x11 painting because the sponges crumbled into pieces. Poor quality and very disappointing. Merchant response: Thank you for your feedback. We have checked our inventory of this item to ensure they meet our quality standards. This customer was given a refund. great for painting projects for my 3 year old. not sure of durability because only used them once. Nice natural sponges - no sand and they hold up well even with repeated use in class!